The Samsung Galaxy Rugby Pro is a durable smartphone running on Android 4.0 Ice Cream Sandwich with a 1.5 GHz Dual-Core processor. 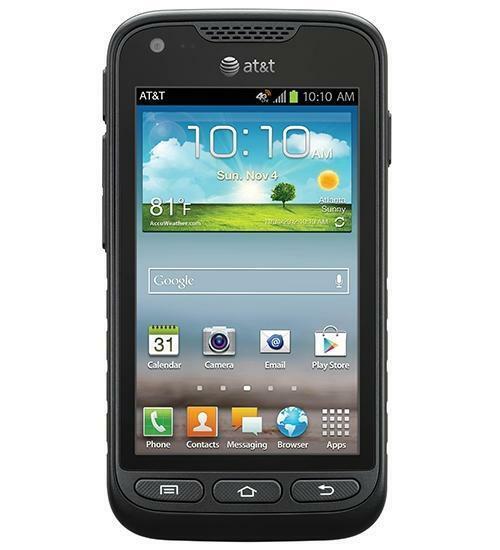 Built tough to weather any storm, the Samsung Galaxy Rugby Pro combines durability with utility. With built in encryption features, all of your private and confidential information on your phone is secure and safe. The Galaxy Rugby Pro’s 4 inch Super AMOLED touchscreen display lets you enjoy movies, games, and more with exceptional color quality even in direct sunlight. Bring out the inner photographer in you with the 5 megapixel full HD rear facing camera, which takes stunning pictures and videos in full 1080p HD. With an 1850 mAh battery, you’ll get 11 hours of talk time and 14 days of sweet battery life. Aaron does a review of Samsung's Galaxy Rugby Pro, a rugged smartphone from AT&T. Aaron reviews the Samsung Galaxy Rugby Pro, a rugged smartphone from AT&T. Aaron unboxes the Samsung Galaxy Rugby Pro, a new rugged device that's available at AT&T for $99.99. VOTE NOW for your favorite smartphone at http://www.phonedog.com/rankings Visithttp://www.PhoneDog.com for all the latest cell phone news, reviews, and more.